Last Sunday I’ve posted the epilogue of my blog novel “Under A New Sky”, that was the end of a journey started this April, the 28th. This novel is a little project of mine but it has been quite useful for me to explore and understand more about my actual limits of developing and writing a story in english. You may find the index here. Now you know that Howard managed to get back on our planet. What you still do not know is that he returned to Zeranta as soon as possible, with as many useful stuff he could transport with him. You see, for him there is very little left on our planet. His family was already gone and with his “death” every tie with friends and comrades in the US Army was gone too. It took almost four years to get this opportunity. Even with the full power of two AI like OmniPlan and SIMCU the amount of data to be calculated was huge, with a slight but unnerving error margin to keep everybody nervous. OmniPlan recorded every high-energy event since its deployment on the Zeranta’s surface, SIMCU did the same from space following its original program. With their combined one-thousand year old mass of data and the results of the OmniPlan’s training program with all the interviews of more than two thousand Terrans we could set in motion a try to develop a mathematical model of the time-space relations between Earth’s surface and Zeranta’s. My little GPS unit, useless here without its net of satellites, was of great help with the thousands of waypoints I’ve recorded in the last few years on Earth while on duty for the US Army. No way to complain if anything goes SNAFU. Halkan’s army was on the move. Losing his tactical advantage with the destruction of his cavalry regiment was too much for the prince to hold on to his own battle plan. So they were retreating, heading back south and keeping formation at regiment level to hold King Harkoon’s heavy cavalry at bay. They were following the course of the river, both to secure a flank and to have an easy access to water. Harkoon’s army was still near the capital, it looked like the king was more than happy to avoid a major battle. Small groups of explorers were tracking the progress of the rebels, maybe somebody was hoping to return to “status quo ante” . I did not agree. Short after dawn I was already on the opposite side of the river, running at top speed to reach the vanguards of the rebels. Halkan was escorted by a small group of armored riders, some kind of honor guard for the wannabe king. As I spotted him a good part of his soldiers already got me in their crosshairs, my guess was that the tale of the missing regiment was more than enough to keep their attention focused. They tried to got me with hundreds of arrows, a good part of them steel-tipped. I was too far from them to be worried about it but it was strange for me to see an entire army react to a single enemy. What I had to do was to take my chances and jump to the other side of the river, my will to revenge was overwhelming. At dawn I was a few yards from the river, Keller sent ten of his best warriors with me for cover. Moving at night was a sort of a LSD trip, with Omniplan holograms that popped up here and there for a few seconds. I noticed that its expressions were still of great pain but there was less alternation between male and female figures. Maybe it was already integrating its personalities. After my transformation I leapt over the river, landing ten yards from a guarding post of the King’s troops. Then I run like the Devil, circling the northern part of the capital before sprinting to the west direction. My hope was to avoid detection from Halkan observers and to get his cavalry in the open, before they could start an organized attack to the town or in the direction of the refugees. I had no clue about the whereabouts of that regiment, nor I had any information about their organization. Once again, it was all about hope. In our plan if I didn’t find them by noon I had to jump as fast as I could in the north direction in order to avoid a confrontation after sunset. More than a month ago I’ve announced a brand new project for a pulp-oriented novel (check here for the related post) and I’m still working in the documentation phase, a real threat for a history fan like me. 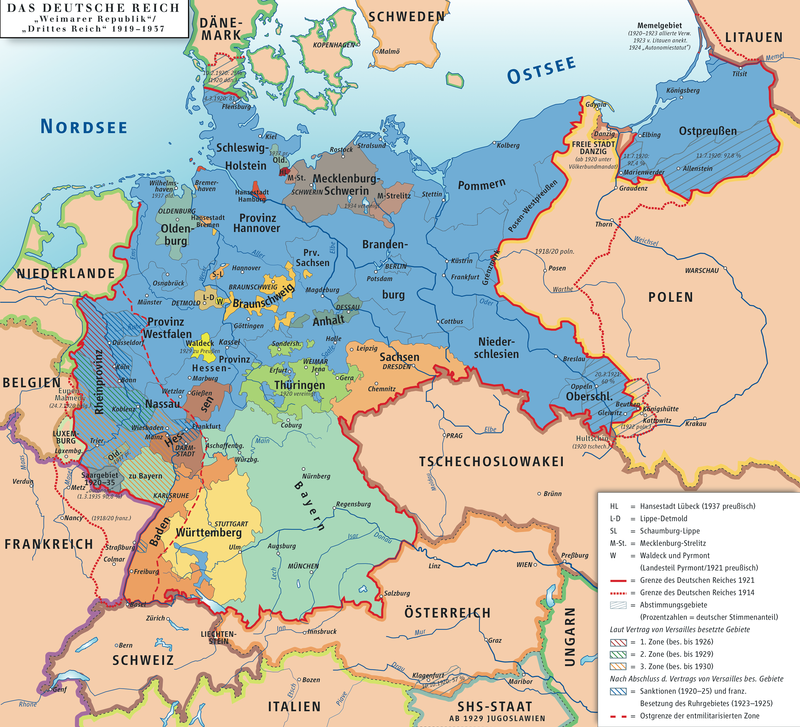 The period of Weimar Republik was amazing, almost everything was at stake on daily basis. Germany in the ‘20s was a frail nation, torn by the consequences of WWI and divided as never before. The Omniplan crisis was in full effect, leaving both armies with no information at all about their enemies. For Zeranta it was the dawn of a new era of warfare. For ten centuries their field battles were all about fast tactical moves developed when already in contact, the only way to overcome the constant flow of informations about enemy’s movements. For what Kellan told me in their chronicles full scale battles has been no more than five in the past, every king of their history avoided such confrontations without a real superiority by his side. This time was much different. King Harkoon and Prince Halkan got about ten thousand fighters each, both armies got strong and weak points. Loyalist had a heavy cavalry regiment, rebels a regiment of light equipped cavalry. Loyalist got some catapults at hand near the capital, rebels didn’t have none. Halkan lost his wild card, the “ghost” unit, and Harkoon lost the choice to use me against his son. The old king was right, there were all the conditions for a bloodbath like never before on Zeranta.